This biker only hostel is located eight miles west of Dubois, Wyoming, 21 miles south of Togwotee Pass, and 45 miles south of the entrance to Grand Teton National Park. We are situated on both the TransAmerica and Great Divide bicycle routes. It is 75.8 miles from the Ray Lake Campground just west of Lander to our hostel. 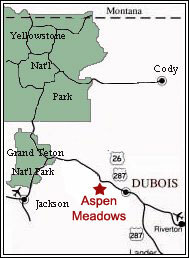 We are located about 8 miles west of the town of Dubois, Wyoming. A convenient place to call ahead from is the Crowheart Store in Crowheart, Wyoming. Go to the junction of US 26/287 and Union Pass Road. You will see a store at the intersection (Dunoir Station with log construction and a red roof). It is a left turn on to Union Pass Road. You will arrive at our hostel after having descended from Togwotee Pass and have passed the Tie Hack Historic Monument on your right. Go to the junction of US 26/287 and Union Pass Road. You will see a store at the intersection (Dunoir Station with log construction and a red roof). It is a right turn on to Union Pass Road. Ride 0.5 mile south on gravel Union Pass Road to the hostel. It is on the right side of the road just as the road bends to the left against the mountain. If you start climbing you've gone too far. 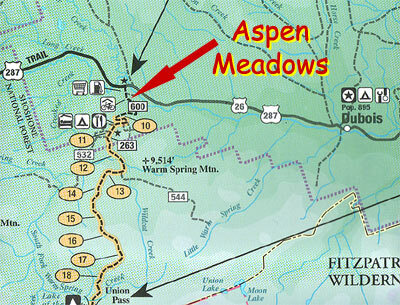 We have a yellow World Traveler bicycle leaning against the Aspen Meadows sign in front of the hostel. It is a green house with a brown steel roof and skylights. For the Great Divide Rider our hostel is situated in a saddle in the route at 7200'. It's right between Togwotee Pass (9658') and Union Pass (9210'). Either way you'll enjoy a fast descent to our place then rest for the night before a long pull up the other side. You will arrive at our hostel after a nice descent off Union Pass on Forest Service Road 600 (also called Union Pass Road). Our hostel is 0.5 mile before you turn left onto US 26/287 to join the TransAmerica trail for your climb onto Togowotee Pass. Look for the sign for our hostel. It will be on your left just before you enter the clearing 0.5 mile from the highway. You will have made a fast descent from Togwotee Pass on paved road. Treat yourself to our hostel near the intersection of US 26/287 and Union Pass Road. There is a store at that intersection. Turn Right onto the gravel Union Pass Road (FR 600) and look for the signs just 0.5 mile from the intersection. It's on the right side of the road just as the road bends to the left against the mountain. If you start climbing you've gone too far. We are on your route!